Unlike Wicca or Ceremonial-Magick practices, Hoodoo does not require the practitioner to acquire exotic tools and implements, or to cleanse them with complex rituals at magickally auspicious times. Hoodoo was born out of the magickal practices of a people who were often denied personal possession beyond what was absolutely needed and so magic was often conjured with what was on hand. For this reason the tools of conjure are, more often than not, common every-day items that can be found in the average household or readily available in nature. Below is just a list of a a few such items and a brief description of how I've used them magickally. 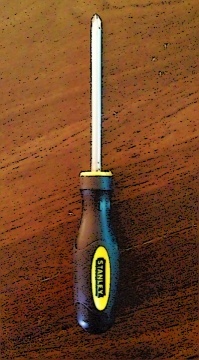 Screwdriver: I have a Phillips head screw driver that I've used now for a couple of years for the express purpose of carving words and symbols on candles. The thickness is about the same as that of a pencil and the pointed tip is excellent for writing on wax. In addition, I use this tool to drive holes in glass encased candles for the purpose of putting herbs and oil in those holes. Brass Candle Holder: I have a long brass candle holder the type of which I can unscrew from it's base. You'd probably think that I burn candles in this holder, but you'd be wrong. In fact, I use this candle holder like a candle-snuffer to 'snuff' out candles. I've found that a metal spoon can be used just like a candle-snuffer as well. Wine-Glasses: Wine glasses that have a flat base can be turned upside down and used like a candle-holder. Other items such as personal concerns, curios, seals, etc..., can be placed under the wine glass as the candle burns down. Shoe Strings: I often save the old shoestrings and use them to do cord magick spells for myself. Saucers: Pillar candles can be burned on top of saucers. In the Hoodoo tradition, saucers are turned upside down and petitions, taglocks, etc... are placed under the saucer while candles burn on top of the saucer. Stencils: Those plastic stencils that you can get from Walmart, Craft Stores, etc... that have the entire alphabet on them can be used in conjunction with a pendulum for a makeshift Ouija board. Alternately, the alphabet stencil can be placed in a picture frame and a coin or over turned shot glass can be used as a pointer. Magnets: Some magickal practitioners may not agree with me on this one, but I've often used magnets in place of lodestones in some spells. Coin Purses: Coin purses can substitute for mojo bags in a pinch. Coaster: The cork board can be removed from wooden coaster and magickal symbols can be burned into the wood to make a talisman. Cutting Board: I have a dedicated cutting board that I use as a candle board. I often spread out powders and herbs on this board in which to roll candles in after anointing them with oil. Ash Trays: Metallic ash trays can be used as braziers for burning incense, or paper petitions. Picture Frames: I've placed a black piece of construction paper in picture frames and then used the the frame as a magick mirror; in addition I have a paper talisman in a picture frame hanging over the inside of my front door to protect my home and goods from intruders. Dolls: Action figures and store-bought dolls can be used to house spirits, or named after an individual and used just like a poppet or voodoo doll. Board Game Tokens: I've often used game tokens such as those used to play monopoly (the shoe, money sack, etc..) or clue (lead pipe, knife, rope) as charms in mojo bags. Arcade Tokens: The token are often circular and engraved with symbols, that can be magickal with the right imagination. The oldest charm in my medicine bag is an arcade token depicting a wizard throwing off his hat and kicking up his heels in joy and is a reminder to myself to maintain a sense of humor. Coins: Coins often depict symbols such as animals, luminaries such as the sun or moon, and/or vegetation. These coins can be blessed and carried as talismans. For example I've heard of woman using the Sacajawea coins as talismans to conceive a child, since it shows a woman carrying a child on her back. Other items you'll find in a conjure worker's cabinet include candles, lead-pencils, brown-paper grocery sacks for writing petitions, chamois/flannel cloth for sewing mojo bags, playing cards for performing readings, dirt from various locations, personal-concerns, doll-babies, condition oils, herbs and roots to name a few. As you can see, the practice of conjure need not be an expensive endeavor and most items needed to cast spells and make charms are either readily available to the average person or otherwise easily obtainable.